Of course, it’s something of an irony that a debauchee who took sexual promiscuity to new levels employed somebody called Alcock. This fact was nicely pointed out in the play and film The Libertine and, when I saw both productions, I assumed the cheeky Cockney character to be a creation of writer Stephen Jeffreys, the surname a perfect way to squeeze in a giggle or two. It was, therefore, a surprise for me to find Thomas Alcock not only existed in reality but also boasted a top education and social respect. The name may mean nothing to you. If you’re into Restoration England though, I can assure you the names of some he’s linked with will ring more than a distant bell. As biographical accounts go, this must have posed a challenge to Susan Margaret Cooper, as seeking out information on lesser-known individuals such as Mr Alcock is never an easy task. However, the book is satisfyingly full of facts and speculation is logically discussed, taking the reader along the route with the author as she connects her findings to put forward theories and explanations. While the ins and outs of one person’s life remain the focus of the work, Cooper also makes room for a bit of historical context in her work. From the provocations of the Civil Wars in which Alcock grew up to the happenings of the Monmouth Rebellion he fought against, there’s just enough detail to set the scene but not distract from the subject. This helps immerse even non-historians and is interesting reading in itself. Getting down to the nitty-gritty though, some of the real gems to be found in this book are the documents the author has uncovered and reproduced as both images and transcripts. I dread to think how long it took to copy type from 17th-century handwriting, especially with such attention to detail. You’ll find the original spellings, unexpected capitalisation and use of superscript bringing the transcripts to life as you read. Adding similar feeling to the account is an array of pictures, with portraits putting faces to names, a 20th-century shot of one of Alcock’s homes and publication title pages all serving as a perfect illustration. Assessment of the personality of anyone from the past is a tricky matter to approach. The objective is always safer than subjective when it comes to something like this and Susan Margaret Cooper has stuck to relating the data but in doing so she’s opened up a nice window into the heart of this man. The word ‘friend’ and ‘friendship’ crop up several times in the book and exemplify the close bonds he evidently formed with those he met, especially, it appears, those he worked for. Without the amazing research of Cooper, however, we would have no real insight at all into this man, as letters she has uncovered reflect something of his character, while her report that he was chosen as an arbitrator demonstrate the high regard he seems to have been held in. Thomas Alcock was associated with a wide range of people. Two of the most intriguing parts of this book, however, takes us back to that employer immortalised in a film for his hedonistic ways. 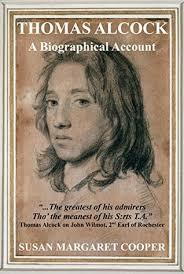 When it comes to Alcock’s time under John Wilmot, Second Earl of Rochester, the shocks come in two forms. On the one hand, things get spooky thanks to some remarkable ghost stories. But perhaps the bigger jaw-dropper is not in the supernatural but in the indisputable true story of deceit that’s enough for a movie of its own. Thomas Alcock: A Biographical Account is non-fiction. But some of the content really gets your imagination going. The effort put into this research is evident and, what’s more, has paid off. It’s the sort of work that can answer historians’ questions, with figures, names, places etc. all included throughout and the revelation of new information makes this a publication to celebrate. By sharing Alcock’s story, we can better understand a person who has long since passed but, like each and every other being on Earth deserves to never be forgotten.